Desktop publishing began in 1983 with a program developed by James Davise at a community newspaper in Philadelphia. The program Type Processor One ran on a PC using a graphics card for a WYSIWYG display and was offered commercially by Best info in 1984. (Desktop typesetting with only limited page makeup facilities had arrived in 1978–9 with the introduction of TeX, and was extended in the early 1980s by LaTeX.) The DTP market exploded in 1985 with the introduction in January of the Apple LaserWriter printer, and later in July with the introduction of PageMaker software from Aldus, which rapidly became the DTP industry standard software. Later on, Adobe PageMaker overtook Microsoft Word in professional DTP in 1985. The term "desktop publishing" is attributed to Aldus Corporation founder Paul Brainerd, who sought a marketing catch-phrase to describe the small size and relative affordability of this suite of products, in contrast to the expensive commercial phototypesetting equipment of the day. Before the advent of desktop publishing, the only option available to most people for producing typed documents (as opposed to handwritten documents) was a typewriter, which offered only a handful of typefaces (usually fixed-width) and one or two font sizes. Indeed, one popular desktop publishing book was entitled The Mac is not a typewriter. The ability was revolutionary to create WYSIWYG page layouts on screen and then print pages containing text and graphical elements at crisp 300 dpi resolution for both the typesetting industry and the personal computer industry. Newspapers and other print publications made the move to DTP-based programs from older layout systems such as Atex and other programs in the early 1980s. By the standards of the 2010s, early 1980s desktop publishing was a primitive affair. Users of the PageMaker-LaserWriter-Macintosh 512K system endured frequent software crashes, cramped display on the Mac's tiny 512 x 342 1-bit monochrome screen, the inability to control letter-spacing, kerning, and other typographic features, and discrepancies between the screen display and printed output. However, it was a revolutionary combination at the time, and was received with considerable acclaim. While desktop publishing software still provides extensive features necessary for print publishing, modern word processors now have publishing capabilities beyond those of many older DTP applications, blurring the line between word processing and desktop publishing. In the early days of graphical user interfaces in the early 1980s, DTP software was in a class of its own when compared to the fairly spartan word processing applications of the time. Programs such as WordPerfect and WordStar were still mainly text-based and offered little in the way of page layout, other than perhaps margins and line spacing. On the other hand, word processing software was necessary for features like indexing and spell checking, features that are common in many applications today. As computers and operating systems have become more powerful, versatile and user-friendly in the 2010s, vendors have sought to provide users with a single application platform that can meet almost all their publication needs. In 2010-era usage, DTP does not usually include digital tools such as TeX or troff, though both can easily be used on a modern desktop system and are standard with many Unix-like operating systems and readily available for other systems. The key difference between electronic typesetting software and DTP software is that DTP software is generally interactive and "What you see [onscreen] is what you get" (WYSIWYG) in design, while other electronic typesetting software, such as TeX, LaTeX and other variants, tend to operate in "batch mode", requiring the user to enter the processing program's markup language (e.g., Hyper Text Markup Language or "HTML") without immediate visualization of the finished product. This kind of "workflow" is less user-friendly than WYSIWYG, but more suitable for conference proceedings and scholarly articles as well as corporate newsletters or other applications where consistent, automated layout is important. In the 2010s, interactive front-end components of TeX, such as TeXworks or LyX have produced "what you see is what you mean" (WYSIWYM) hybrids of DTP and batch processing. These hybrids are focussed more on semantics than traditional DTP. 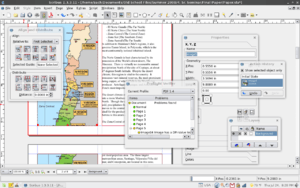 There is some overlap between desktop publishing and what is known as Hypermedia publishing (i.e. Web design, Kiosk, CD-ROM). Many graphical HTML editors such as Microsoft FrontPage and Adobe Dreamweaver use a layout engine similar to a DTP program. However, some Web designers still prefer to write HTML without the assistance of a WYSIWYG editor, for greater control and ability to "fine-tune" the appearance and functionality. Another reason that some Web designers write in HTML is that WYSIWYG editors often result in excessive lines of code, leading to "code bloat" that can make the pages hard to troubleshoot. The design industry standard is Encapsulated Postscript. Adobe InDesign proprietary format is also common among graphic design professionals. Microsoft Publisher format is common for home users. Open formats include OpenDocument Graphics used as default in OpenOffice.org and LibreOffice. ↑ "What You See Is Pretty Close to What You Get: New h&j, pagination program for IBM PC, " Seybold Report on Publishing Systems, 13(10), February 13, 1984, pp. 21-2. ↑ "Type-X '85: Fulfilling the Promise of the PC, " Seybold Report on Publishing Systems, 15(2) pp. 4-5. ↑ Thompson, Keith (8 June 1987). "MacIntosh Layout Package Remarkably Fast, Powerful". InfoWorld. 9 (23): 51. Retrieved 2011-04-15. An early (and comprehensive) reference book on the art of desktop publishing is Desktop Publishing For Everyone by K.S.V. Menon. This publication deals with virtually every facet of publishing and nearly all tools available at the time (2000). It is currently out of print.